DENISOV Chamber Symphonies Nos. 1 and 2. Au plus haut des cieux. Even 17 years after his death, it is difficult to pin down Edison Denisov’s esthetic aims and his place in musical history. He was certainly an important figure in the development of Soviet music in the second half of the 20th century, an avant-gardiste who almost singlehandedly introduced the music of the Second Viennese School to Soviet Russia, enabling the modernist movement by the generation of composers that followed Shostakovich. But he was also a deeply passionate Francophile, and these works, dating from the last decade or so of his life, seem to owe more to Debussy, Dutilleux, and Messiaen than they do to Schoenberg and his pupils. That said, there is a strong sense of linearity about the music that speaks of a deep affinity with the serial literature and its associated techniques. None of the music here is strictly serial (I don’t think), but it shares with serialism a penchant for linear/polyphonic textures and a casual disregard for tonal reference of any kind. Generically, the two chamber symphonies on this disc also suggest Schoenberg, but both are written for smaller ensembles than Schoenberg’s essays in the medium and neither are particularly symphonic. The French quality in this music comes through in the focus on tone color, which here seems an end in itself rather than a means for clarifying the counterpoint, as we often find in Schoenberg. Denisov also displays a fairly relaxed approach to musical form, more often relishing the moment than driving forward towards some structurally defining climax. The Chamber Symphony No. 1 was written in 1982 and consists of three movements for just 12 players. Woodwind colors predominate, but the work also includes a concertante piano part and several brass instruments, all of which are put to subtle, delicate, and almost impressionistic use. The lack of direction can be frustrating here, and while (serial?) manipulations appear to be dictating the changing pitch content, the timbre and dynamics remain frustratingly fixed for long periods. Au plus haut des cieux is a song cycle written in 1986 to words by Gorges Bataille. A similar, although slightly larger, ensemble is used to the First Chamber Symphony, and the instrumental textures are similarly dreamy and nebulous. The vocal line brings a welcome point of focus for the ear, and the slightly astringent but always lyrical vocal writing maintains the interest, even for non-Francophone listeners, myself included. Denisov’s relationship with the music of 20th century France becomes more complex and more interesting in this piece. Influences from Debussy and perhaps Ravel are apparent, but not Boulez (despite a friendship between the two men) and certainly not the spectralists. Denisov made many visits to France (he died in Paris), yet his music gives the impression of being cut off from recent developments in the country, and trying to reconstruct them from a distance. Cinq romances d’Anna Akhmatova is a song cycle by Denisov’s wife, Ekaterina Kouprovskaia-Denisova, who also provides the liner notes to this release. The work appears here in an orchestration by Denisov himself, but the use of the ensemble is about the only aspect of this music that connects it with the rest of the program. Kouprovskaia-Denisova works in a more tonal style—more Fauré than Messiaen—and imbues each song with a distinctly late-romantic sensibility. They are elegantly constructed though, and the ascetic settings perfectly match the economy of means in Akhmatova’s lines (sung here in French). The program closes with what must be one of Denisov’s final works, his Chamber Symphony No. 2 of 1994. This single movement work is considerably less constrained than its predecessor, with occasional outbursts from the percussion and a brass section that often moves into the louder dynamics. But it is clearly the work of the same composer, and, like the First Chamber Symphony, is based throughout on serially derived (or at least inspired) instrumental lines that are woven together into continually changing tapestries of sound. Ensemble Orchestral Contemporain gives colorful but also suitably subdued performances. Tonal control is a key virtue here, and each of the instrumentalists maintains both an elegant sound and a carefully calibrated balance within the ensemble. Soprano Brigitte Peyré sings with clarity and presence. Her tone is occasionally thin, especially in the upper register, but the music rarely requires her to perform the loud or the sustained notes that could make this unpleasant. Harmonia Mundi France provides their usual warm but clear audio environment for the performers. 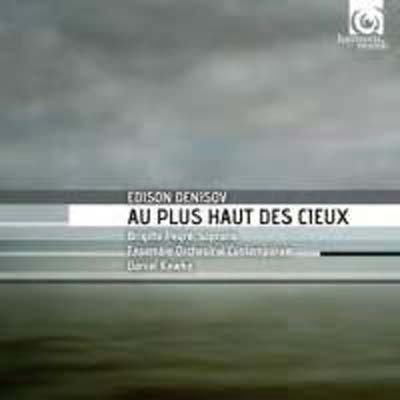 In fact, both the performance and the recorded sound have an intrinsically French quality, and perhaps that makes these late utterances from Edison Denisov sound even more French in style than they actually are.